In recent months, the cause of freedom has made enormous gains in the broader Middle East. Millions of people in Afghanistan and Iraq defied terrorists to cast their ballots in free elections. Palestinians voted for a new president who rejects violence and is working for democratic reform, and the people of Lebanon reclaimed their sovereignty and are now voting for new leadership. Across the Middle East, hopeful change is taking place. People are claiming their liberty. And as a tide of freedom sweeps this region, it will also come eventually to Iran. The Iranian people are heirs to a great civilization - and they deserve a government that honors their ideals and unleashes their talent and creativity. Today, Iran is ruled by men who suppress liberty at home and spread terror across the world. Power is in the hands of an unelected few who have retained power through an electoral process that ignores the basic requirements of democracy. The June 17th presidential elections are sadly consistent with this oppressive record. Iran's rulers denied more than a thousand people who put themselves forward as candidates, including popular reformers and women who have done so much for the cause of freedom and democracy in Iran. The Iranian people deserve a genuinely democratic system in which elections are honest - and in which their leaders answer to them instead of the other way around. The Iranian people deserve a truly free and democratic society with a vibrant free press that informs the public and ensures transparency. They deserve freedom of assembly, so Iranians can gather and press for reform and a peaceful, loyal opposition can keep the government in check. They deserve a free economy that delivers opportunity and prosperity and economic independence from the state. They deserve an independent judiciary that will guarantee the rule of law and ensure equal justice for all Iranians. And they deserve a system that guarantees religious freedom, so that they can build a society in which compassion and tolerance prevail. Today, the Iranian regime denies all these rights. It shuts down independent newspapers and websites and jails those who dare to challenge the corrupt system. It brutalizes its people and denies them their liberty. America believes in the independence and territorial integrity of Iran. America believes in the right of the Iranian people to make their own decisions and determine their own future. America believes that freedom is the birthright and deep desire of every human soul. And to the Iranian people, I say: As you stand for your own liberty, the people of America stand with you. President Bush, addressing the Iranian people on the eve of their presidential election, today denounced Iran's electoral system as undemocratic and vowed that America would stand with those seeking "freedom" in the Islamic Republic. In a statement distributed by the White House, Bush charged, "Today, Iran is ruled by men who suppress liberty at home and spread terror across the world. Power is in the hands of an unelected few who have retained power through an electoral process that ignores the basic requirements of democracy." He added, "The June 17th presidential elections are sadly consistent with this oppressive record." The statement amounted to a repudiation of the elections and the seven candidates for president, three of whom have campaigned as reformists and are considered relative moderates by local standards. This group includes the front-runner, Ali Akbar Hashemi Rafsanjani, 70, a Shiite Muslim cleric who has served two previous presidential terms. Although he was formerly known as a hard-liner, Rafsanjani now bills himself as a reformer who intends to improve relations with the West, including the United States, and liberalize the economy. It was not immediately clear how Bush's criticism would play in Iran, where many people, especially the young, have become alienated by 26 years of rule by fundamentalist Shiite clerics. These hard-liners hold unelected positions with supreme authority over the elected government and legislature. It was this theocratic structure that was the main target of Bush's statement today. "Across the Middle East, hopeful change is taking place," Bush said, citing elections in Afghanistan, Iraq, Lebanon and the Palestinian territories. "People are claiming their liberty. And as a tide of freedom sweeps this region, it will also come eventually to Iran." Bush said Iran's unelected rulers rejected more than 1,000 presidential candidates, "including popular reformers and women who have done so much for the cause of freedom and democracy in Iran." He said Iranians "deserve a genuinely democratic system in which elections are honest -- and in which their leaders answer to them instead of the other way around." He called for a free press, freedom of assembly, a "free economy" independent of the state, an independent judiciary and religious freedom. "Today, the Iranian regime denies all these rights," Bush said. "It shuts down independent newspapers and Web sites and jails those who dare to challenge the corrupt system. It brutalizes its people and denies them their liberty." Bush concluded: "America believes in the independence and territorial integrity of Iran. America believes in the right of the Iranian people to make their own decisions and determine their own future. America believes that freedom is the birthright and deep desire of every human soul. And to the Iranian people, I say: As you stand for your own liberty, the people of America stand with you." Although Bush did not mention any Iranian leaders by name, his statement appeared designed to drive a wedge between the public and the system headed by Ayatollah Ali Khamenei, who holds the lifetime title of "supreme leader." He is the successor to Ayatollah Ruhollah Khomeini, the hard-line Shiite cleric who led a 1979 revolution against the Iranian monarchy and made the country an Islamic Republic. Khomeini died in 1989, and an assembly of senior clerics chose Khamenei to fill his role, which was enshrined in a 1979 constitution. In addition to the supreme leader, who has final say on all state matters, the theocracy vests power in a Guardian Council, an unelected body of 12 clerics and Islamic jurists who can veto any legislation they consider un-Islamic and bar any candidate from running for president or parliament. The current president, Mohammad Khatami, was elected in 1997 in a landslide over a hard-line candidate and was reelected in 2001. A moderate cleric, he has sought to institute reforms but has been largely stymied by Iran's theocratic overlords. He is barred from running for a third consecutive term. Rafsanjani, who served as president from 1989 to 1997, currently heads the Expediency Council, a body that arbitrates between the 290-member parliament and the Guardian Council. Even if he comes out on top of the seven-man field (women are barred from running), Rafsanjani is considered unlikely to win a majority of the vote, a development that would force a run-off election between the two top vote-getters later this month. Nearly 47 million of Iran's 68 million people -- all Iranians over the age of 15 -- are eligible to vote. Turnout in the 2001 presidential election was 67 percent, and analysts are watching tomorrow's turnout for indications of popular commitment to -- or alienation from -- the political system. Please distribute this statement by President BUSH by Email or any other means to all Iranians NOW. 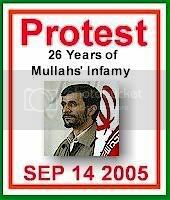 Please End Iran's Mullahs race with blast from President BUSH with no DEAL Message from US for Mullahs and Dead Regime Without Any Future. Maximize the Boycott Messages to Iran by any means. رئیس جمهوری آمریکا در پیامی که در باره انتخابات ریاست جمهوری اسلامی روز پنجشنبه توسط کاخ سفید منتشر شد، حکومت ایران را به سرکوب آزادی ها متهم کرد و گفت ایران در اختیار حاکمان نامنتخب است. جرج بوش افزود انتخابات 27 خرداد با پیشینه سرکوب دمکراسی و بدون الزام های اساسی دمکراسی انجام می گیرد. وی گفت مردم ایران سزاوار آزادی، یک نظام واقعا دموکراتیک، حکومتی پاسخگو، اقتصادی آزاد و قوه قضائی مستقل هستند که تضمین کننده آزادی ها باشد. وی افزود امروز حکومت ایران تمام این حقوق را از مردم دریغ می دارد. وی گفت آمریکا در کنار مردم ایران که برای آزادی خود به پا خاسته اند قرار دارد. درماه‌های اخیر آرمان آزادی در سراسر خاورمیانه بزرگ به دستاوردهای بزرگی دست یافته است. میلیون‌ها نفر درافغانستان و عراق با رای خود در انتخابات آزاد با ترور به چالش برخاسته‌اند. فلسطینی‌ها به رئیس جدید تشکیلات رای داده‌اند که با خشونت مخالف است و برای پیشبرد دموکراسی تلاش می کند. مردم لبنان نیز حاکمیت خودرا باز می‌یابند و در حال رای دادن به رهبری تازه‌اند. در سراسر خاورمیانه تحولات مساعدی شکل می گیرد. مردم در ادعای کسب آزادی خویشند. موج پرکشند آزادی در منطقه، سر انجام به ایران هم می‌رسد. ایرانیان وارث تمدنی بزرگند سزاوار حکومتی هستندکه آرمانهایشان را پاس دارد و به خلاقیت ها و استعداد هایشان دامن بدهد. امروز، ایران توسط کسانی اداره می شود که آزادی را در کشور سرکوب کرده و در خارج به گسترش ترور در سراسر جهان مشغولند. قدرت حکوت در ایران در دست مشتی حاکمان نامنتخب است که قدرتشان را از راه انتخاباتی فاقد الزام های دموکراسی حفظ می کنند و متاسفانه انتخابات 27 خرداد نیز با همین پیشینه سرکوب برگزار می شود. حاکمان ایران بیش از هزار نفر داوطلب را از حق انتخاب شدن محروم کردند و در میان این رد صلاحیت شدگان، شماری از اصلاح طلبان و زنان دیده می شوند که درراه آرمان آزادی و دموکراسی تلاش می کنند. مردم ایران سزاوار یک نظام واقعا دموکراتیک هستندکه انتخابات آن صادقانه باشد، نظامی که درآن رهبران در مقابل مردم پاسخگو باشند و نه برعکس. مردم ایران سزاوار یک جامعه واقعا آزاد و دموکراتیک هستند که درآن مطبوعات آزاد مردم را آگاه و شفافیت را تضمین کنند. مردم ایران سزاوار آزادی تجمع هستند تا بتوانند گرد هم آیند . برای اصلاحات و تشکیل یک اپوزیسیون مسالمت جو، وفادار، که دولت را کنترل کند، پافشاری کنند. آنها سزاوار یک اقتصاد آزادند که رفاه ، فرصت و استقلال اقتصادی را در مقابل دولت فراهم کند. آنها سزاوار یک قوه قضائی مستقل اند که حکومت قانون و عدالت را برای همه ایرانی‌ها تضمین کند. آنها سزاوار نظامی هستند که آزادی مذهب را تضمین کند تا بتوانند جامعه‌ای بسازند که درآن محبت و مدارا غلبه داشته باشد. امروزه رژیم ایران تمامی این حقوق را از مردم دریغ می دارد روزنامه های مستقل و سایتهای اینترنتی را می بندد. وکسانی را که جرات می کنند در مقابل این نظام فاسد بایستند زندانی می کندبا مردم با خشونت رفتار می کند و آنهارا از آزادی هایشان محروم می کند. آمریکا به استقلال و تمامیت ارضی ایران اعتقاد دارد.آمریکا به حقوق مردم ایران در اینکه خودشان در باره آینده شان تصمیم بگیرند اعتقاددارد. آمریکا اعتقاددارد که آزادی حق فطری و خواست عمیق هر انسان است و من به مردم ایران می گویم همان طور که شما برای آزادی تان به پا خاسته اید مردم آمریکا در کنار شما هستند. President Bush criticized Iran's election process in which more than 1,000 would-be candidates were barred from running by the hardline Guardian Council supervisory body. Eight were allowed to stand, but one hard-liner has quit. "Power is in the hands of an unelected few who have retained power through an electoral process that ignores the basic requirements of democracy," Bush said in a statement. "In Iran we have candidates from different tendencies while in America there are two candidates, from Republicans or Democrats. Bush is not worried about democracy in Iran. His remarks are based on hostility and enmity," Asefi said. President Bush says presidential elections in Iran are designed to keep power in the hands of rulers who he says suppress liberty at home and spread terror across the world. President Bush says Friday's election in Iran is, in his words, "sadly consistent with the oppressive record of an unelected few, who have retained power through an electoral process that ignores the basic requirements of democracy." In a written statement, Mr. Bush said Iran's rulers have prevented more than a thousand candidates from running in this election, including popular reformers and women, who, the president says, have done much for the cause of freedom and democracy in Iran. Several candidates are in a tight race to replace outgoing President Mohammad Khatami, who is barred from seeking re-election by term-limit laws. Former President Akbar Hashemi Rafsanjani, who has campaigned in part on improving relations with the United States, is leading most opinion polls. Analysts expect Friday's poll will not produce an outright winner, and will require a run-off election. In his statement, President Bush said the Iranian people deserve a truly free and democratic system, in which elections are honest. He says they deserve freedom of assembly, so they can press for reform and a peaceful, loyal opposition to keep the government in check. Mr. Bush says Iranians deserve a free economy that delivers opportunity and prosperity and economic independence from the state. He says they also deserve an independent judiciary that will guarantee the rule of law and ensure equal justice for all people. President Bush says the regime in Tehran denies all these rights. He says it shuts down independent newspapers and Web sites, and jails those who dare to challenge what he calls a corrupt system. Mr. Bush says Americans believe in the right of the Iranian people to make their own decisions and determine their own future. U.S. officials say they believe Iran is developing a secret nuclear-weapons program and wants the country to agree to additional inspections by the International Atomic Energy Agency. Iran says its nuclear program is only for generating electricity. WASHINGTON, June 16 - On the eve of the Iranian election, President Bush declared today that Iran's electoral process failed to meet "the basic requirements of democracy" said that the "oppressive record" of the country's rulers would undercut the legitimacy of the vote. Mr. Bush's statement, which contrasts sharply to the praise that the Bush administration delivered to Egypt and Saudi Arabia for very modest moves toward the most limited forms of democracy, appeared to amount to a pre-emptive American effort to challenge Friday's vote. But at a briefing today, Scott McClellan, Mr. Bush's press secretary, denied that the president was applying a different standard for allies and than for others. He deflected questions about why the administration stopped well short of criticizing Egypt for restrictions on candidates in its forthcoming election; indeed, Mr. Bush's wife Laura praised the election during a recent visit to Egypt. Mr. McClellan also declined to make any comparisons between Iran's rulers and to the Saudi royal family. The Saudis have refused to allow direct challenges to its rulers. Administration officials said Mr. Bush was not trying to influence the outcome of the Iranian election as much as he was attempting, in the words of one senior official, to "call it what it is." For weeks the Bush administration has been debating how to deal with the coming election in Iran. Mr. Bush's aides appear to be preparing for the return of Ali Akhbar Hashemi Rafsanjani as president. Though there are eight candidates on the ballot, Mr. Bush today denounced both the current government and the method of selecting the next president. "Today Iran is ruled by men who suppress liberty at home and spread terror across the world," he said in a statement. "Power is in the hands of an unelected few who have retained power through an electoral process that ignores the basic requirements of democracy." He called Friday's election "sadly consistent with this oppressive record." "Iran's rulers denied more than a thousand people who put themselves forward as candidates," he said, "including popular reformers and women who have done so much for the cause of freedom and democracy in Iran." Just hours after Mr. Bush issued his statement, the president's representative to the International Atomic Energy Agency, Jackie Sanders, accused the Iranian government of continuing to deceive the agency about its past nuclear activities. Ms. Sanders cited the disclosure on Wednesday that Iran experimented with plutonium, which can be used to produce a nuclear weapon, for five years beyond the time that Tehran had previously insisted the laboratory work had ended. "We will not accept a nuclear weapons-capable Iran," she said. The wording was significant, because "weapons capable" appears to suggest that the United States would not permit Iran to possess the means to make a weapon, a stricter standard than the Nuclear Nonproliferation Treaty's prohibition on possessing a weapon. Under the treaty, Iran would be permitted to have the equipment and technology to enrich uranium, which could be used either for nuclear power generation or, at higher levels of purity, as bomb fuel. On the eve of Iran's presidential election, President Bush said the voting has been designed to keep power in the hands of a few rulers "through an electoral process that ignores the basic requirements of democracy." "The Iranian people deserve a genuinely democratic system in which elections are honest ? and in which their leaders answer to them instead of the other way around," Bush said in a statement released by the White House Thursday. "And to the Iranian people, I say: As you stand for your own liberty, the people of America stand with you." Friday's election will choose a successor to President Mohammad Khatami, who came to power in 1997 and is barred by law from seeking a third term. His attempts to introduce liberal reforms were thwarted by hard-line clerics loyal to supreme leader Ayatollah Ali Khamenei. The election also comes as Iran faces international pressure over its nuclear program from the United States and Europe. Seven candidates, most of them hard-liners, are competing in the race that has featured Western-style tactics such as distribution of colorful campaign posters. At least two of the candidates in Friday's polls have promised to improve Iran's relations with the United States, which severed relations after the 1979 Islamic Revolution. They are front-runner Hashemi Rafsanjani and the reformist former Cabinet Minister Mostafa Moin. The hard-line ruling clerics loyal to Khamenei are hoping the vote will consolidate their power. The Guardian Council, a watchdog for Iran's theocratic constitution, initially barred reformers from running. But Khamenei, who has the final say on all state matters, forced the council to reverse that decision. He apparently was worried that low turnout could undermine the ruling Islamic establishment and weaken its position in crucial negotiations with Europeans over Iran's nuclear program and embolden the United States. The United States claims Iran is secretly working on a nuclear weapons program in tandem with its first energy-producing reactor, scheduled to begin service early next year. Iran denies that and has ongoing contact with European envoys to end the impasse. Still, the council kept more than 1,000 people who wanted run off the ballot. "Iran is ruled by men who suppress liberty at home and spread terror across the world," Bush said. "Power is in the hands of an unelected few who have retained power through an electoral process that ignores the basic requirements of democracy. The June 17th presidential elections are sadly consistent with this oppressive record." Some 500 people demonstrated in front of the main radio and television building in Tehran Thursday, calling on Iranians to boycott the polls because the process is unfair. But other reformists have urged against disillusionment, warning that a boycott could pave the way for a totalitarian state and help hard-liners consolidate their grip on power. Bush said Iranians are heirs to a great civilization and deserve a government that honors their ideals with a free press and economy, freedom of religion and assembly and an independent judiciary. "Today, the Iranian regime denies all these rights," Bush said. "It brutalizes its people and denies them their liberty." Posted: Thu Jun 16, 2005 6:28 pm Post subject: When Is an Election Not an Election? When Is an Election Not an Election? It's symptomatic of the failure of strategic vision from which our chatterers and leaders currently suffer, that so many words and so much energy are being wasted on the immense charade that goes under the name of Iranian "elections." Any normal person familiar with the Islamic republic knows that these are not elections at all, and for extras have nothing to do with the future of the Iranian nation. They are a mise en scene, an entertainment, a comic opera staged for our benefit. The purpose of the charade, pure and simple, is to deter us from supporting the forces of democratic revolution in Iran. Ask yourself two simple questions. Does the president of Iran hold any real power? Has any "candidate" (of which there are eight) been chosen by anyone other than the supreme leader and his cronies? No, and no. Whoever is "elected" (and you can be sure that the outcome is already known, millions of "officially cast" ballots having been manufactured weeks ago, to ensure the right guy wins and that enough votes will have been cast) will be an instrument of the mullahcracy. The sole "issue" in the farce is how best to convince George W. Bush that it would be wrong for the United States to press on with support for the forces of freedom in Iran, because that would "force" the mullahs to crack down (which they are doing already). The slogan for the post-electoral period will be "give reform a chance." And you can be sure that the useful idiots among us, from the Amanpour woman at CNN to the Haass man at the Council on Foreign Relations, have already prepared their sermons and their slogans, ranging from "hopes for a new relationship" to "a rare opportunity for an historic dialogue," and other such slogans. We have heard these slogans before, applied to other tyrannies shortly before they attacked democratic societies. When Stalin ruled the Soviet empire, great attention was paid to elections to the Politburo, as if the Molotovs and the Berias were independent actors, capable of moderating or liberalizing or reforming the Soviet Union. When the Fuhrer ruled the Third Reich, even British diplomats confidently announced that Hitler had "no further territorial ambitions," and was, after all, surrounded by reasonable industrialist types like Goehring. And who can forget � actually, who can remember � the surge of empathy when it was announced that comrade Chernenko � until yesterday the boss of the KGB and now the new Soviet dictator � liked jazz? Sensible folks have learned that it isn't about personality, it's about freedom and tyranny. All the totalitarian regimes of the last century staged elections, and they were all meaningless, because the structure of the state concentrated power in the two hands of the dictator, and exercised through the single party. The president has had this right for a long time, and I'm delighted to report that, three days ago, the State Department spokesman delivered an eloquent condemnation of the fraudulent exercise about to take place in Tehran. And I am also pleased that Human Rights Watch has started to pay attention to the grave condition of dissident journalist Akbar Ganji. Perhaps the editorialists at the New York Times and the Washington Post could tear themselves away from the imagined horrors of Guantanamo and denounce the systematic oppression of nearly 70 million Iranians. It is unlikely this will happen, both because any journalist in Iran who reports fully on the nature of the regime risks expulsion or � as in the celebrated case of the female Canadian journalist who got too close to the truth � death. And because anything that makes the Iranian regime "look bad" automatically makes W "look good," and most journalists don't want that. Who's going to win, you ask? I don't know. For months I have assumed that Rafsanjani would walk away with it. But when Supreme Leader Khamenei ostentatiously overruled his henchmen, permitting a nasty pseudo reformer by the name of Moin to run, I have wondered if Khamenei knew something I didn't. Rafsanjani's sins � from gross corruption to mass murder � are fairly well known, and there are probably limits beyond which even a British foreign secretary or a French foreign minister will not go to make nice to the mullahs. President Rafsanjani would test those limits. Moin, on the other hand, isn't so well known, he's got that lean and hungry look instead of Rafsanjani's portliness, and he might be more convincing as he plays that most difficult role: the moderate face of islamofascism. I haven't checked the morning line recently, and I certainly wouldn't bet the family oil well on it, but a small bet on Moin might be a good hedge. On the nose, of course (have you seen the pictures?). � Michael Ledeen, an NRO contributing editor, is most recently the author of The War Against the Terror Masters. He is resident scholar in the Freedom Chair at the American Enterprise Institute. 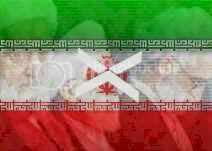 WASHINGTON - On the eve of Iran's presidential elections, the Bush administration said Thursday the exercise was illegitimate and tilted to favor the ruling Islamic mullahs. Secretary of State Condoleezza Rice said Iran was choking off political freedom just as other Middle East countries were exploring greater openness. Thousands of would-be candidates, and all women, were arbitrarily barred from running, Rice said at a news conference. "I can't see how one considers that, quote, a legitimate election," Rice said. She said election plans in neighboring Egypt are "an important first step" toward democratic progress. Egypt has also limited participation in its election, and international critics have called the process a sham. Egypt is an important U.S. ally with a checkered record regarding human rights and political freedom. Rice makes her first visit there as secretary of state next week. "This is not the last step in Egyptian reform," Rice said. "This is going to have to be a process. Democracy isn't a single-day event." Egyptian President Hosni Mubarak has held power for nearly a quarter century. A growing opposition movement uses the one-word slogan, "Enough." Rice's decision to cancel an earlier planned visit to Egypt in March was widely seen as a protest to the Mubarak government's crackdown on an opposition leader. Mubarak announced plans for the country's first multiparty elections soon afterward. On Iran, President Bush said the voting has been designed to keep power in the hands of a few rulers "through an electoral process that ignores the basic requirements of democracy." "The Iranian people deserve a genuinely democratic system in which elections are honest � and in which their leaders answer to them instead of the other way around," Bush said in a statement released by the White House. "And to the Iranian people, I say: As you stand for your own liberty, the people of America stand with you." The United States severed relations with Iran after the 1979 Islamic Revolution. Rice took questions from reporters on a range of subjects ahead of her trip to the Middle East and Europe. Expansion of democracy will be a centerpiece of the trip, along with support for Israel and the Palestinians as the date approaches for withdrawal of Israeli settlers from the Gaza Strip and portions of the West Bank. Asked about growing dissatisfaction with the progress of the Iraq war and efforts to rebuild the country, as reflected in U.S. public opinion polls, Rice said she and other members of the administration will "perhaps try to do more" to make the case for continued engagement in Iraq. "This is hard. And I think that everybody knows that the American people have been asked to support a complex and difficult task in trying to help the Iraqis in overthrowing a dictator, then to create a viable and united and democratically based state." Turning to another world hot spot, Rice said it isn't enough for North Korea to return to stalled six-nation disarmament talks. Pyongyang must commit to discuss dismantling its nuclear program, she said. "The ball is in the North Koreans' court." North Korean diplomats earlier this month suggested they were willing to return to the talks but did not offer a date. "Until we have a date, we don't have a date," Rice said. On Uzbekistan, Rice acknowledged relations have been strained because President Islam Karimov has rebuffed U.S. pleas for an independent international investigation into a massacre by Uzbek troops of protesters in Andijan. She said the United States won't temper its message to the Uzbek government out of fear that the Uzbeks will cut off access to an important U.S. military base. "Az ra'y nadaadan natarsid...az ra'y daadan negaraan baashid"
Please forward the above information to friends and family. RP's interview with CNN was excellent. I really like the way he handled the interviewer and kept the focus on Iran and boycotting the regime instead of getting distracted.